Think you know what a TV should look like? 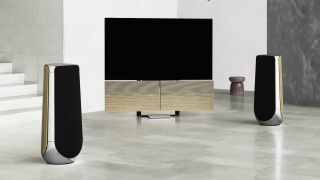 Think again – the striking new Bang & Olufsen Beovision Harmony OLED TV is quite unlike any television we've ever seen. Making its debut at the 2019 Milan Design Week, the Beovision Harmony features two "wings" made of oak and aluminium that house its sound system. They sit together as a square in front of the television (which is essentially the brand new LG C9 OLED, optimized for the Bang & Olufsen system) when it is off. Switch the set on and the screen rises and the wings fold out, acting as a front-facing soundbar of sorts, ready for your viewing session. Switch it off, and they all fall back into that resting position, with the speakers ready to be used as a regular sound system. It’s a uniquely design-first approach from the Danish brand that plays with the increasingly prevalent trend of hiding a TV in plain sight, making them part of the furniture as much as a piece of technology, as with Samsung’s arty The Frame TV. So, choreographed and motorised speakers aside, what else has the Beovision Harmony going for it? According to the Beovision Harmony press release, the screen at its center is basically the LG OLED C9 in it 77-inch configuration, with some tweaks to make it work with the butterfly-effect speakers. It’s a performance-to-price oriented screen from LG that packs up-to-date features powered with some new image processing tweaks. So you’ll get the full suite of LG’s webOS 4.5 smart apps, such as Netflix and Amazon, as well as AirPlay 2, Chromecast and Bluetooth connectivity, as well as all the usual benefits of a top-flight OLED. The speakers are in a three-channel configuration and are designed to work with Bang & Olufsen’s multiroom speaker sets such as the Beolab 18, Beolab 50 and Beolab 90. You can pair up to eight of these wireless speakers with the set, with the TV capable of decoding 7.1 surround sound. All can be controlled by the aluminium Beoremote One remote. Launching in October 2019, the TV and speaker system will retail together for 18,500 Euro, which at the time of writing converts to $20,780 / £15,945 / AU$29,245. For some context, the LG C9 alone is set to retail at $6,999 / £7,499 (around AU$9,800). The Beovision Harmony will be available in either an oak wood and aluminium style, or a "Grey Melange" fabric and aluminium look. Both can work with either a floor stand or wall bracket. It’s definitely eye-catching, but is it any good? We’ll be going hands, ears and eyes-on with the Beovision Harmony shortly, so check back soon for our first-look thoughts.